One of the best views in Harbour Cove! Spacious 2 bed & den home features electric window shades, custom build-in cabinetry, hrdwd flrs, crown mouldings, baseboards & cozy wood burning fp. Gourmet kitchen boasts sleek granite countertops with custom cherry wood cabinets & SS appl. Enclosed balcony offers perfect home office with built-in desk. Enjoy unobstructed 180 degree views of Burrard Bridge,False Creek Marina,Downtown skyline,mountains, Granville Bridge to Fairview Slope. Bldg incl: squash crt, pool, sauna, whirlpool, exercise & party rm. 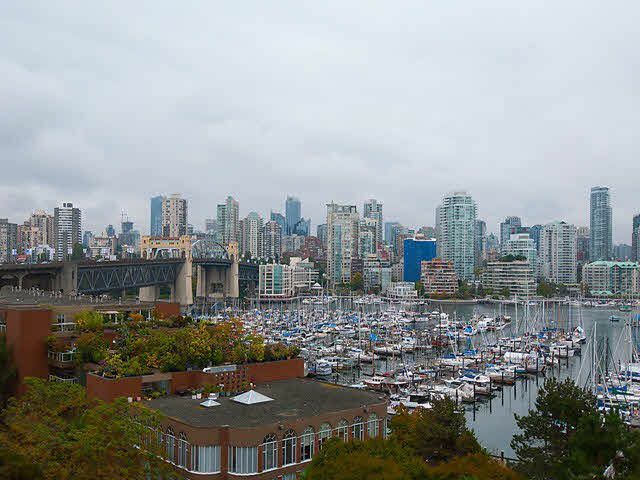 Harbour Cove is resort-like Freehold strata community, located on False Creek a short stroll away is Granville Isl, restaurants & the best d?cor boutiques.